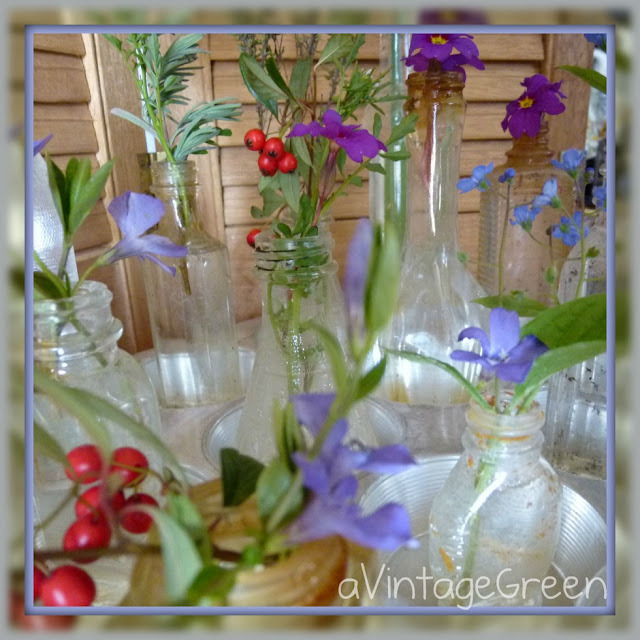 Tiny, small and middling sized bottles from an old dump site. Well aged. They came to me an an very full and very heavy to carry orange plastic carry case. Pretty grungy. Ran them all through the dishwasher and picked out the ones that were interesting. Recycled the rest. Soaked some in CLR. Didn't seem to clean them very much. Soaked some in Polident. Sort of helped. Rinsed well, dried. Sorted. Then I read a post filled with pictures of coloured water in small bottles with little flowers added and decided to try a type of 'copy cat'. 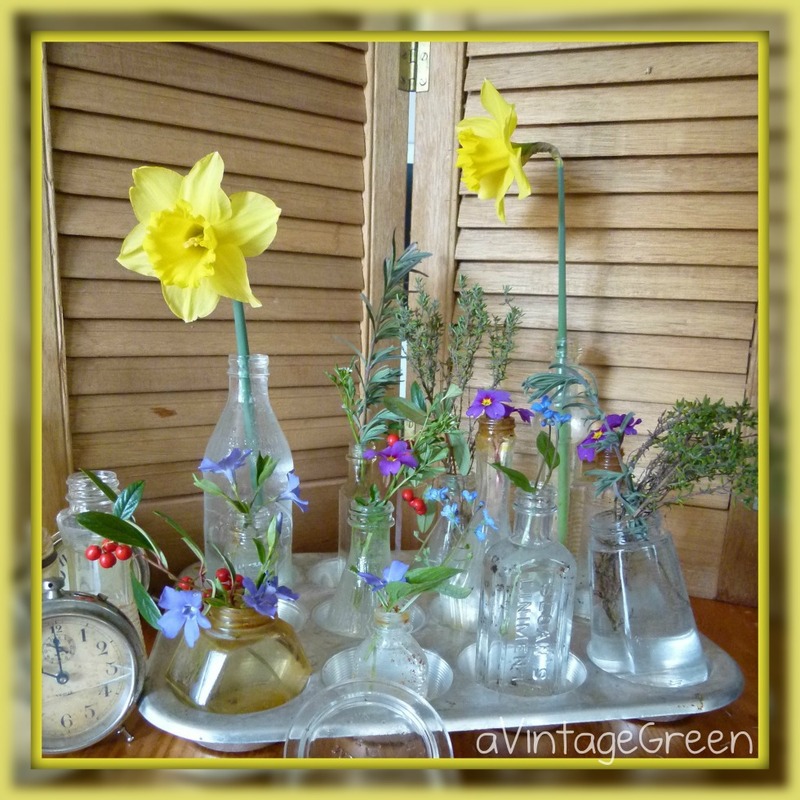 Take a peek at Mary of Boogieboard Cottage who made some very pretty flower displays using Aqua Ball Sealers. Decorations are from my back yard; primroses, daffodils, sage, oregano, red berries, forget-me-nots. Couldn't resist the mirror frame option in Picnik. Pure pleasure. Snapshot of a tiny piece of time. My sister will recognize the folding shutters - she had to haul them, store them, haul them again. Thanks dear one. 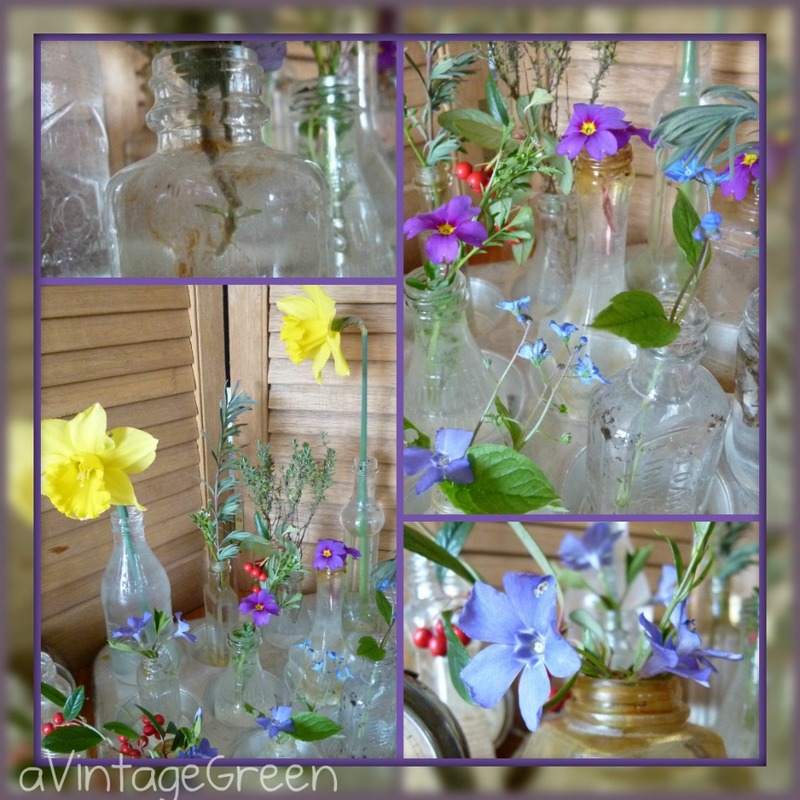 Take a peek at Granny Sue's News and Reviews flowers in blue glass bottles. When I find a bottle I want to keep, I soak it overnight in hot white vinegar. Pretty post today, love your garden decorations. 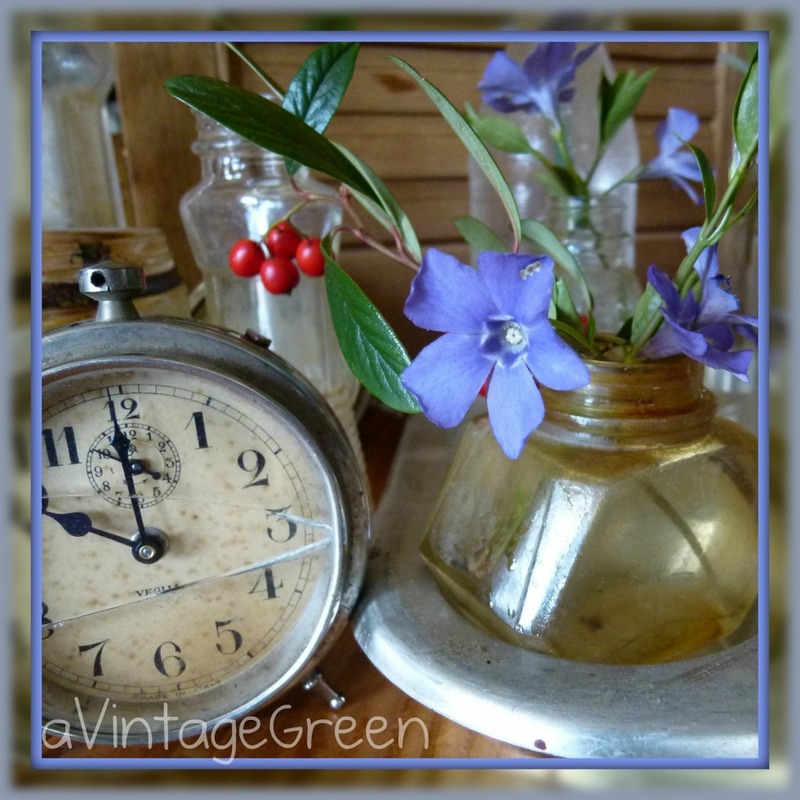 They are just perfect Joy for single stems.I wish I could dig up some lovely old bottles like them. 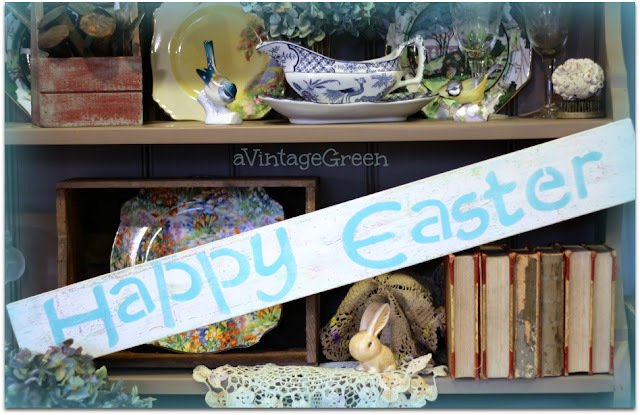 You shared this link on the BlogLovin' Hop (Blog Hop not Linky Party). Do you have an account with Bloglovin' so that I can update your link to Bloglovin'? How perfectly lovely, Joy! Now I'm looking around to see what bottles I can use...thanks for the idea. I love all the little bottles filled with flowers. I bought a little wooden crate with tiny bottles and I love it, but I think I prefer your mishmash of bottles and flowers. Sweet and simple - perfect! I need to collect some little bottles! What great little vases your old bottles make for single stemmed flower displays. They make quite a statement when grouped all together. My husband sometimes brings me home old bottles. Sometimes the glass is discolored and kind of shiny inside, even after cleaning. I think that just adds to their charm! Love all your different size and shape bottles. They look so sweet with flowers.